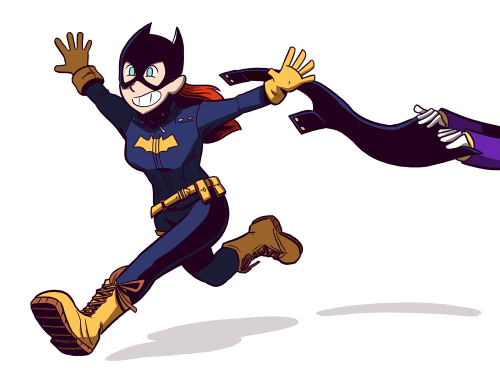 Edit: the artist is Babs Tarr (Babs is drawing Babs!). She's a big deal. Check her out. The response has been epic. Within a day (I am not kidding), fan art from professional and independent graphic artists flooded the Intertubes. Part of it is due to the outfit being so damn sensible: instead of it being a glorified swimsuit, or spandex form-fitting distraction, the new outfit is practical. Leather jacket and armor. Regular boots (although the laces may be a weak spot!). The utility belt (no Bat goes without one) uses an additional leg strap to keep it and the main pouch secure. The cowl doesn't get trapped over the ears. Above all: THE CAPE. Batgirl is going to employ a simple, sensible alternative: snap-on, snap-off cape (via Sam Logan). See Kara popping that snap-on? Yup. Fans dig the snap-on. 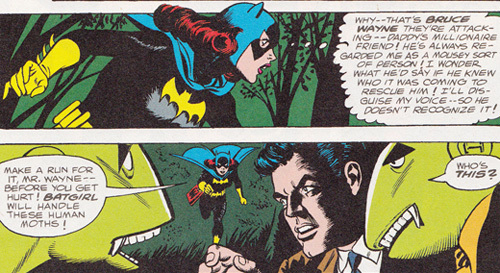 Part of the response is due to the background of Barbara Gordon herself. Ever since her inception in the mid-1960s (the Silver Age), Barbara's place among the fandom has been usually well-received. When the Killing Joke happened - the infamous issue where the Joker paralyzed her by shooting through her spine - the horrified response was universal (even the writer Alan Moore - himself a master Deconstructor, he dissed the capes too - regretted the move). 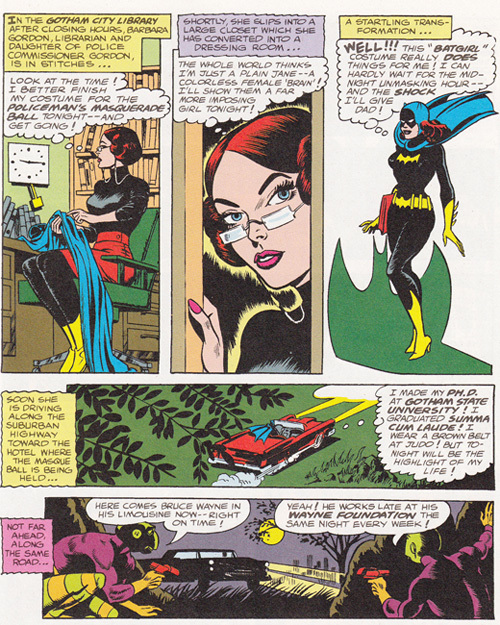 Bat-fans within the industry quickly worked to make Barbara a new heroine - Oracle - while the fans working via fanart and fanfic came up with stories of her regaining the use of her legs. It took yet another multiverse Crisis (DC unfortunately has gotten into the sad habit of rebooting itself every 3-4 years now /headdesk) to return to an earlier reboot making her college-age again and back to mobility. One things the comics creators try to do is develop a character/hero the potential audience can relate to. When it became clear that kids were superhero books' biggest readers, the publishers created "sidekick" pre-teens (Speedy, Robin, the Newsboy Legion) to act as in-story surrogates. Sometimes it worked, sometimes you'd get a Scrappy. In Barbara's case, she was relatively unique. Most sidekicks - and heroes that mentored them - came from damaged backgrounds, suffering some terrible injustice or fleeing a deadly fate that would become a motivating factor in their decision to dress up and fight crime. Barbara was on her way to a costume ball, dressed up as her favorite superhero, when she has to stop Killer Moth - yes, villains from the 1950s and 1960s were a bit lame - from kidnapping Bruce Wayne. She's pretty much an ascended cosplayer. I wonder how many costumers at the Tampa comic-con are gonna have snap-on capes... (don't look at me. I'm gonna try to fit into the Jedi outfit mom sewed for me). 2) Bad news: found out I had a flat tire. Equally bad news, nearly crushed a finger coping with the nightmare of getting the spare tire off and nearly losing the car on the driveway incline. Good news: finger's just bruised and was able to get the tire fixed rather cheap and refilled with Nitrogen. 3) Bad news: still lonely. Good news: ...well, I need to figure out social skills before I can fix this kind of bad news... sigh.